Sew Inspired: Happy Independence Day! I made this quilt in 2001. It's hand quilted, and one of my first improvised quilts. I remember really enjoying making it. Not exactly the colors I would choose this year, but it's still cute. It would be fun to remake it in brighter colors and with wonky stars. I spent the morning sewing and going up and down the stairs to work on the laundry backlog. Baby's quilt top is done. I'd like to start on piecing the back but will feel better if I spend some time cleaning the kitchen. 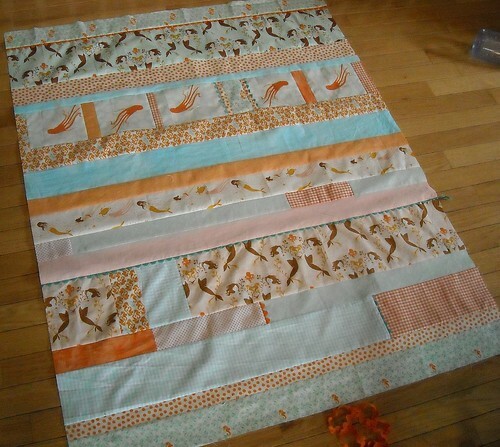 I'm thinking about using the peach-y baby corduroy for most of the quilt backing. I ordered 2 yards from fabric.com a while back, thinking it was a baby pink color, but it turned out to be a bit orange, which means it works well with these Mendocino fabrics. I have used this same fabric for two baby quilts already -- I love it! :) Nice job. 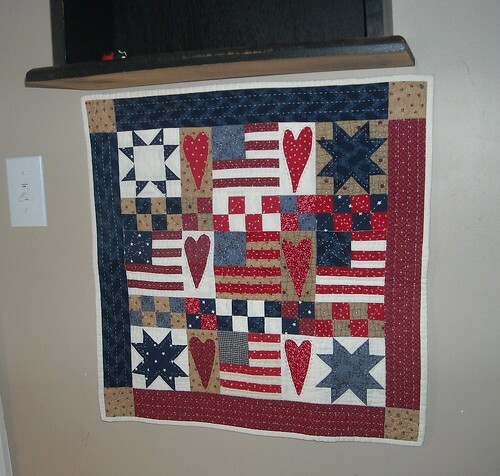 I think your Patriotic quilt is very cute. And yes, it would be fun to do again with wonky stars. If you want to make a new one I hope you'll write a tutorial for it. I'd love to make one of these. oh your quilt looks so great...is that ric rack...that looks so great. Both those quilts are great! I love both of them, and you have been busy! Love the dress in the previous post! The baby quilt looks great! I love those HR fabrics! Lovely fabrics in the baby quilt. mini-quilt monday #2, "summer breeze"